Introduced in 1991, the GMC Yukon has long been a leading name when it comes to full-size SUVs, and in recent years the impressive design and power of the Yukon XL has been undeniable. 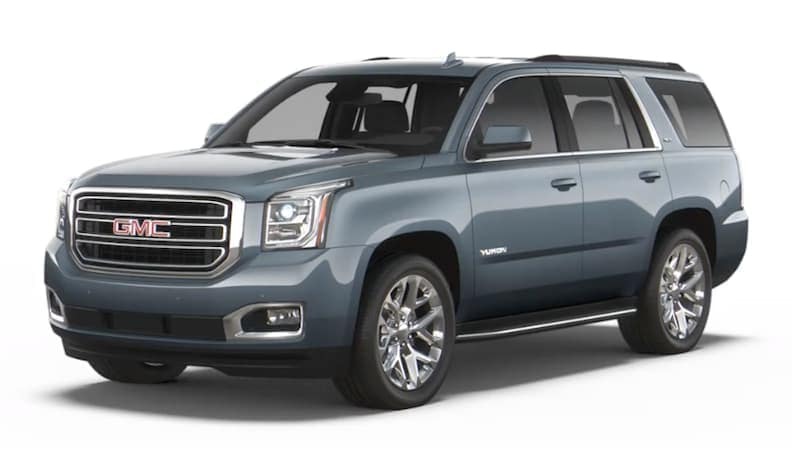 Fortunately, nothing about that has changed and the 2019 GMC Yukon XL is one of the most beautiful and impressive SUVs on the road. An eye for gorgeous design is clearly apparent inside and out, and we’re happy to say that degree of style and sophistication has not come at the expense of impressive power under the hood. The Yukon XL is slightly longer than the standard Yukon, and that length translates into more interior cargo capacity, especially behind the third-row, and more leg room for third-row passengers. This extra space makes the 2019 GMC Yukon XL the perfect choice for big families, large groups of friends or co-workers who need to travel together, or anyone looking for a full-size SUV to load up for a weekend of camping. Plenty of technology features and options make sure everyone inside the Yukon XL can stay connected and make for a more sophisticated ride than ever before. But all of that power and elegance doesn’t mean safety is sacrificed, and the 2019 GMC Yukon XL keeps family and friends safer than ever before. Standard features like a rear vision camera keep everyone safe, and there are plenty of available options including alerts for lane changes, possible collisions, and even blind-spot detection. You can stay safe and protect your loved ones while hauling big trailer loads, making this the ideal SUV for both work and play. Two different engines are available for the 2019 GMC Yukon XL, though there are some limitations on which you can choose depending on the trim level you want. Four different trim levels are available for the Yukon XL, starting with the SLE, then the SLT Standard Edition, then the SLT, and finally the luxurious Denali. Keep this in mind as you look at the two different engines available from GMC and the configurations in which each is provided. The standard engine that is the only option for the SLE and SLT Standard Edition trim levels is a powerful 5.3L EcoTec3 V8 engine that provides up to 355hp and 383 lb.-ft. of torque. This is plenty of power for most SUV owners and includes variable valve timing, direct injection, and active fuel management to help improve overall fuel economy – a concern for many SUV drivers. This is the starting engine for the Yukon XL SLT, but it is not available for the Denali. A second engine is an option for the SLT and comes standard in the 2019 GMC Yukon XL Denali – in fact there is no engine choice for the Denali, just this powerful beauty. It is a 6.2L EcoTec3 V8 engine that provides up to 420hp and 460 lb.-ft. of torque for truly impressive performance. If you are planning on hauling some heavy workloads with a trailer behind your SUV, then strongly consider either the SLT or Denali so you can have this engine, which ensures you get pretty much any job done. One of the main reasons to choose the 2019 GMC Yukon XL over the standard Yukon is the longer size of the XL. Both versions are the same height, while the standard Yukon measures 203.9 inches long and the Yukon XL is 224.4 inches in length. This makes the Yukon XL about 1.7 feet longer and that extra space is largely used to provide much more storage space and leg room for third-row passengers. The standard Yukon has about 15 cu. ft. of storage space behind the third row, while the 2019 GMC Yukon XL has more than 39 cu. ft.. This increases overall storage – the standard Yukon has up to 94.7 cu. ft. of total interior storage capacity, while the Yukon XL has more than 121 cu. ft. of storage volume. That gives you a lot more room for loading up the Yukon XL with shopping bags or when getting ready for a weekend of camping. This extra space also translates to more leg room for third-row passengers. In the standard Yukon, passengers in the third row have just over 24 inches of leg room, while third-row passengers in the Yukon XL can stretch out with more than 34 inches of leg room, nearly an entire foot more space. The Yukon XL also has a much larger gas tank, with a maximum fuel tank capacity of about 31 gallons, while the standard Yukon has a 26-gallon fuel tank. Although standard features and available technology options can vary depending on the trim level you look at, the 2019 GMC Yukon XL includes some of the best overall tech features on the market. This centers around a gorgeous 8-inch full-color touchscreen Infotainment system that includes available Navigation, which comes standard on the Denali. The Denali also features a second 8-inch driver display that is customizable and provides information directly to the driver. Not to mention great features like a heated steering wheel and seats, keyless open and remote start, and programmable door locks that are easily operated from a key fob. An available 10-speaker Bose Centerpoint Surround Sound system provides a truly immersive listening experience, perfect for long road trips or heading out on a camping adventure. The 2019 GMC Yukon XL has 4G LTE Wi-Fi hotspot functionality and an available wireless charging pad to keep all of your devices fully charged – in addition to numerous USB ports and 12v outlets. Tri-zone climate control ensures everyone inside the Yukon XL stays comfortable and automatically maintains selected temperatures in the front, middle, and rear of the vehicle. The driver of the 2019 GMC Yukon XL has more control and information available than ever before thanks, in part, to numerous steering wheel controls. This lets the driver adjust different settings without ever taking his or her eyes off the road. There is even an available head-up display that projects information directly onto the windshield in the bottom portion of the driver’s line of sight so you can keep your eyes on the road but still see things like vehicle warnings or navigation information. All of the luxury and interior cargo space in the world is pointless if a vehicle can’t keep you and your loved ones safe – and in this area, the 2019 GMC Yukon XL truly shines. While some of these features are standard at any trim level, many of them are available options at starting trim levels and become included at higher levels. The Yukon XL Denali, for example, has every safety feature offered by GMC for the ultimate combination of sophistication and safety. The Yukon XL includes 7 airbags and anti-lock brakes, along with a rear vision camera to help improve rear visibility. Additional safety features include available front and rear park assist to help avoid objects that cannot be seen by the driver and rear cross traffic alert that warns the driver when something moves behind the vehicle while in reverse. Available forward collision alert helps warn drivers of possible dangers in front of the vehicle, and available lane keep assist with lane departure warning helps avoid drifting into another lane – and includes side blind zone alert to warn you when someone is lurking in a blind spot. There is also a Teen Driver safety system that is perfect for any family with a teenage driver who is either just starting out or still building safe driving habits. This system is directly tied to a particular key fob so that it only activates while a teen driver given that fob is behind the wheel. When active, certain safety features are automatically engaged and enabled to help keep teen drivers safe, while other features are either enabled or disabled to help eliminate distractions and encourage safe driving habits. There is also an in-vehicle teen driver report card that gives you information about your teen driver, so you can identify areas that need more work and reinforce safe habits. At Carl Black Kennesaw, we understand that buying a new SUV is not everyone’s idea of a fun way to spend a weekend. Decades of poor service from other dealerships has left a lot of people jaded and cynical about the car-buying experience – which is why it is so important to us to prove that buying a new car, truck, or SUV can be a rewarding and enjoyable process. We don’t believe in high-pressure sales tactics or deceptive tricks to try to get you into a car you don’t want; instead, we believe in helping every customer find just the right car or SUV for your lifestyle and needs. Come to Carl Black Kennesaw to see the 2019 GMC Yukon XL and discover just how enjoyable and rewarding buying a new SUV really can be.